Two weeks ago we bought a Lada and put our stickers all over it. Now I’m about to tell you why. It involves 3,500 miles across some of the most rugged terrain that Turkey, Georgia, Nagorno Karabakh and Armenia have to offer. Are we insane? Maybe. But you have to be a little insane to attempt the Caucasian Challenge, so that’s why we’re doing it. Despite the fact that we didn’t even have time to really test it first, we already drove 1,600 miles eastbound and down from Budapest all the way to the border city of Batumi in Georgia, and our Lada has done a brilliant job so far. But it will need all its 60 horses to climb the mountains laying ahead. 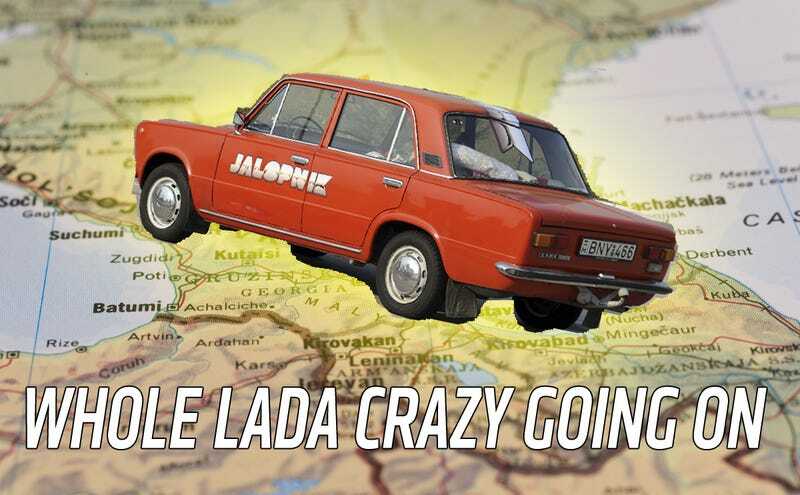 I’ve been planning to do the Caucasian Challenge for a few years, and the fact that I’m crossing it off my bucket list right now driving a 1982 Lada 1200S as far as I’ve never been before with two similarly crazy teammates onboard proves that this summer isn’t going to be short on adventures. The Caucasian Challenge is a minimal assistance road rally leading through Turkey, Georgia, Nagorno Karabakh and Armenia. The latter three being pretty much unknown territory to most, the idea is to discover the hidden wonders of the region while driving a very basic car through places where time was stopped be Stalin himself. Of course since most routes through the mountains are rather challenging for a regular car, teams are free to use four-wheel drive machinery as well, but honestly, what’s the challenge in that? Teams coming from all over the world have used numerous crazy cars throughout the years, and Attila, the guy organizing these trips has done it with a Moskvitch 412 as well. So that’s exactly what he recommended for us. But I’m a Lada man who takes pity of Moskvitch drivers. When I was a small child, we had three VAZ-2102s, the wagon version of the 21o1, so I could pick no other vehicle than a classic Lada. Just for the smell of it. Down on power but up in style, here we go. Our heater is disconnected from the radiator, the thermostat is set to cool the car all the time, the crankcase gases are rerouted to keep our air filter clean, we have dual power outlets and some old guy fabricated a skidplate for the car made of thick steel bars. Despite not having time to test drive the finished product, with almost everything replaced, a trunk packed of spare parts, we set off, because we had to. I never felt more unprepared. In order to make it in time to the starting line in Istanbul, we first had to drive through Belgrade and Sophia before crossing the Turkish border. That’s already a good 800 miles at full speed on the highway, and let’s just say we had to sleep twice in the car before we could agree that all the small glitches have been fixed. Our road map is very detailed and according to the fine print, we only have to look out for mines in a few places where people just can’t seem to agree on where the borders should be. Now that we entered Georgia, it’s straight into the unknown. In good time too. Since highways are being built at a rapid rate in this region too, who knows how long the Caucasus can provide a real challenge? But this time around, our skills and the car’s limits will certainly be tested. Luckily, the other teams brought enough backup power. The Polish mother-daughter pair came with a lifted Land Cruiser after losing their Suzuki Samurai at last year’s Central Asia Rally (also organized by Attila), but the largest car in the fleet by far is a Toyota Tundra custom-built in Hungary. 5.7 liters, a four-inch lift kit and an espresso machine onboard. An English gentleman rented a Land Rover and the only other car without four-wheel drive happens to be a Ford C-Max that has no ground clearance and will take the easy route anyway. Our Lada’s up for all that, right? Our cameras are rolling, the cheap Georgian gas is a joy to burn and it’s still a very long way to Yerevan. Too bad our navigation system is not familiar with Armania. I guess we’ll just have to get a map full of letters we can’t even read. Could be worse! Wish us luck, we’ll send dispatches from the road if we can. Is there wifi out here? Photo credit: Máté Petrány/Jalopnik and The Caucasian Challenge.